Picture this. Lounging on a sunbed, soaked in sunshine and birds twittering in the background, all while admiring the neighbouring World Heritage national park. 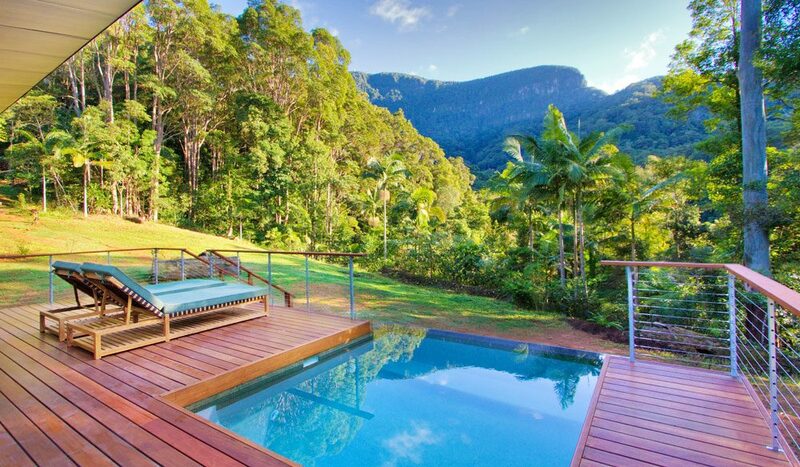 This is Crystal Creek Rainforest Retreat in the Tweed Valley near Murwillumbah, on the New South Wales-Queensland border, surrounded by lofty mountain ridges and tropical rainforest. Of course, no private deck experience would be complete without a solar-heated plunge pool and thankfully, the Luxury Mountain View Lodge comes with just that…as well as sunbeds, an alfresco dining area and a stainless-steel roasting barbecue. It seems the interior has been just as thoughtfully appointed. The open-plan design encompasses French oak floorboards throughout, floor-to-ceiling windows to take advantage of the rainforest views, and a double-sided fireplace that screens the king-sized bedroom from a generous living area. Special extras like a large stargazing skylight (with block-out blind) above the bed and a double marble bath make this an especially romantic escape. Guests staying in any of the retreat’s 10 architect-designed hideaways can also expect fresh, gourmet meals delivered straight to the door, including picnic packs to take with you on a day of exploring – if you ever decide to leave that is. In the meantime, we think the sunbed will suffice just fine.